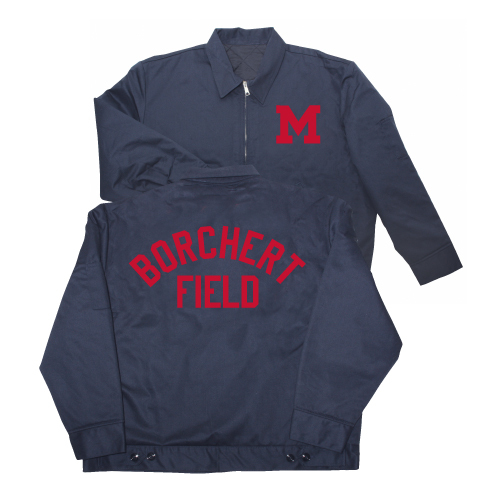 Borchert Field: A Surprise Throwback - 1948! 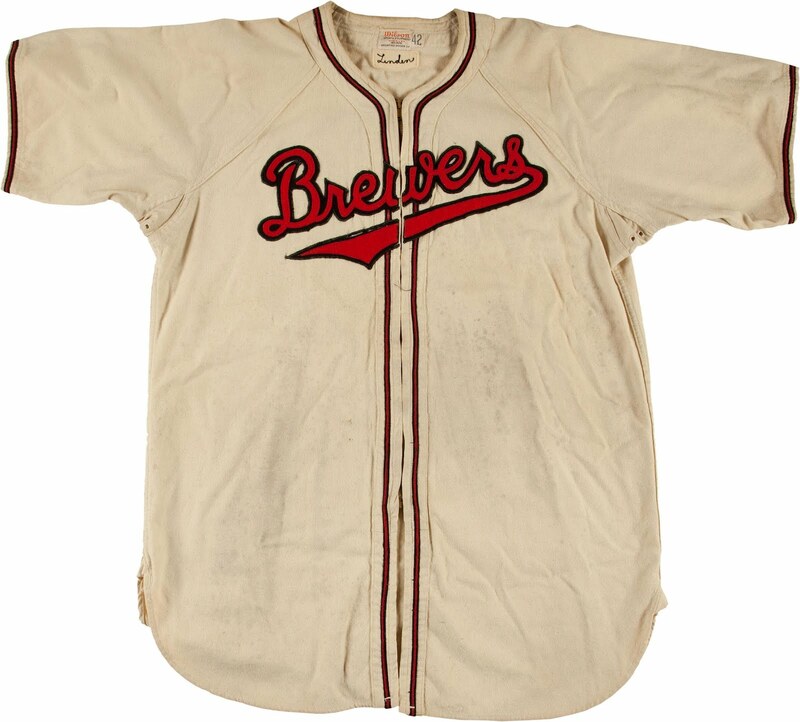 Those beautiful 1913 creams aren't the only American Association throwback uniforms that the Brewers will be wearing this season. On May 30, they will don their forebearers' look in a game against the Minnesota Twins in Minneapolis. The Twins will wear road uniforms from the 1948 St. Paul Saints, which means the Brewers will be clad in the home uniforms of the 1948 Brews (similar to those worn in 1996 as part of a 1946 throwback game). The initial pictures aren't very big, but let's see what we can learn. 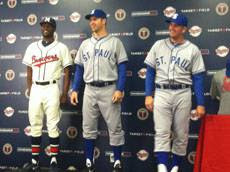 MINNEAPOLIS -- The Twins unveiled their 1948 St. Paul Saints throwback jerseys on Monday for their "Turn Back The Clock" game against the Brewers on May 30 at Target Field. 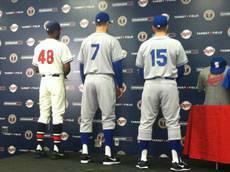 The Twins will celebrate Minnesota baseball history by wearing throwback uniforms of the 1948 St. Paul Saints, while the Brewers will play as the 1948 Milwaukee Brewers. The first 20,000 fans through the gates are set to receive a St. Paul Saints pennant. "The Twins are proud to remember this important part of Minnesota's great baseball heritage as the teams don the uniforms of the St. Paul Saints and the Milwaukee Brewers," said Twins curator Clyde Doepner. "This is truly a case of past meets present at Target Field; a ballpark that will one day be a revered place in baseball history." The 1948 Saints -- a farm team of the Dodgers -- featured future Hall of Famer Roy Campanella, who became the first African-American to play in the American Association. The club was also managed by future Hall of Fame manager Walter Alston and had other future Major Leaguers such as Eric "The Red" Tipton and Dan Bankhead, the first African-American pitcher in Major League Baseball history. Hall of Famers Miller Huggins, Lefty Gomez and Duke Snider also played for the Saints in that era, but not for the '48 club. Throughout the game, the Twins will celebrate the rich heritage of baseball in St. Paul and honor a number of great players who emerged from Minnesota's capital city. Hall of Famer and St. Paul native Paul Molitor will also be available to take photographs with fans pregame from 5:15-6 p.m. CT on Target Plaza by the Majestic Twins Clubhouse Store. A ceremonial first pitch will be thrown by Billy Pederson, who is widely recognized as the face of amateur baseball in St. Paul. He coached Hall of Famers Dave Winfield and Molitor, who will catch the ceremonial first pitch. Bob Klepperich, longtime Saints employee and current manager of Midway Stadium, will raise the Twins Territory Team flag. He also worked in the 1950s at Lexington Park, where the original Saints played. The Saints' throwbacks are nice. They're apparently going all out, with t-shirts and jackets honoring the old club. But enough about them. Let's look at the Brewers' throwbacks. Hard to tell, though, but from the spacing of the placket piping it sure looks like they might have switched from zippers to button-ups. We'll have to wait for better pictures. I wonder if the uniforms were made by Ebbets Field as well? I'm given to understand that Majestic has right of first refusal on making all throwback uniforms, and then the teams can contract out. Majestic made the uniforms for the Brewers' recent throwback game with the Cardinals (knocking it out of the park), but that doesn't guarantee they were involved with this one. Also as an aside, the home team has to supply throwbacks for the visitors, as the Brewers did for St. Louis earlier this year, so it's always nice to see care taken with the road uniforms.